This post is about what my quirky, energetic, 11-year-old son is learning this homeschool year. 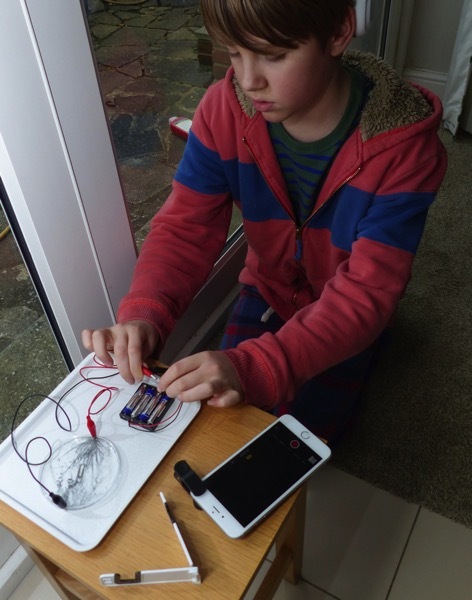 Jasper loves maths, science, audiobooks, Lego and video games. He prefers learning at home, ideally while cuddling our pets, and he keeps us all entertained with his off-the-wall humour. If Jasper were in public school here in the UK, he’d be in his first year of senior school. This has focused his mind on his goal of going to university one day, maybe to study maths. To help him with this goal, Jasper recently decided to reduce his video gaming, to make more time for other forms of learning. We’ve also been using Creative Constructions as a fun way to learn how to use a compass and play with angles, and Jasper’s asked me to get the AoPS Geometry book, so we’ll probably mix in some of that soon. From time to time we also dip into the Life of Fred prealgebra books. Jasper still struggles with handwriting, so learning to touch-type has been a priority for him. He loves Nessy Fingers, and after several years using it he’s now a fast and accurate typist. Recently we’ve added in Nessy Writing Beach (US version here) which is a fun, dyslexia-friendly way to learn grammar, spelling, punctuation and other writing skills. Jasper also occasionally works through the English courses on Study Ladder. Even though he’ll be allowed to use a keyboard for his exams, Jasper knows he needs a basic level of handwriting in life, so he keeps up his habit of doing handwritten copywork from a favourite book several days a week. Last term Jasper and I slowly made our way through Theodore Gray’s The Elements together, which we loved. I’m often conscious of how slowly we make our way through books compared with other homeschooling families. This is partly because Jasper learns best in bite-sized chunks, and partly because we go off on so many tangents. In fact the better the book, the longer we take to read it, because it inspires so many lively conversations. After The Elements, we moved onto Molecules by the same author. Jasper finds some of the explanations in Molecules more detailed than he needs right now, so we’re sticking to the main body text for now while I read the small print for fun on my own. This term Jasper’s also asked to study ‘the kind of science people in school learn’. 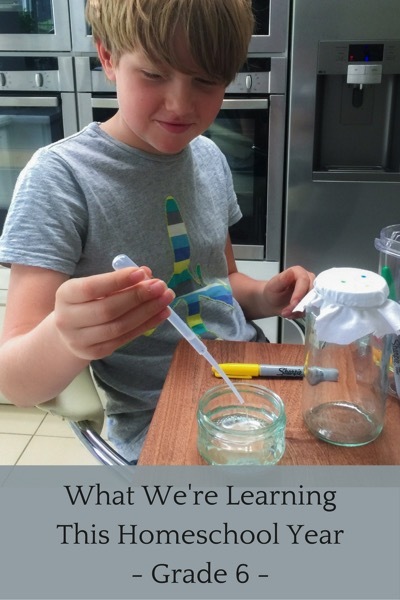 I’m terrible at following curricula, but fortunately we have a friend who’s a whizz at bringing ‘school science’ to life. Meanwhile, of course, we’re still doing fun experiments together. One resource we’re really looking forward to diving into is MEL Chemistry. 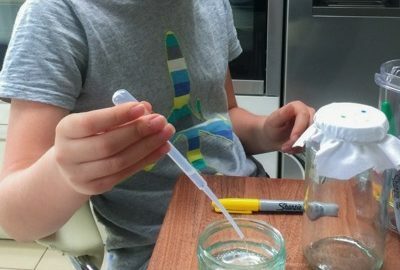 I’ve been looking for something like MEL for years – a proper, professional chemistry kit for young scientists instead of the over-priced, over-packaged toys shops sell as ‘chemistry sets’. So far with MEL we’ve explored redox reactions by using electrolysis to grow cool tin dendrites. I’m looking forward to sharing more about this brilliant resource. Jasper got quite interested in politics last year with the US election and Brexit, so we’ve been reading a few of the Uncle Eric politics and economics books, starting with Whatever Happened To Penny Candy. I’m not sure how I feel about some of the author’s political opinions, but I appreciate very much that he’s created living books aimed at young people. The books are a great starting place for conversations. Meanwhile, both children and I are still enjoying The Story of the World as our jumping-off place for history. We’ve been reading this series regularly for about five years now and we’re only a quarter through the final (fourth) volume! Yesterday I had to ask the kids if I could at least please get to the end of a sentence before replying to a question or comment. While I read aloud, the children played catch with our inflatable globe as they discussed whether or not Bolivia ought to have some of Chile or Peru’s coastline. I wonder if this happens in other families? Jasper loves history and still listens regularly to Tony Robinson’s and John O’Farrell’s books. Despite having a month of language classes in Spain two years ago, Jasper’s never shown much interest in foreign languages and I’ve never pushed him. But recently we were chatting about what five GCSEs he might like to do to ease his path to university (maths, English, physics, chemistry + ?) and he asked if I could teach him some Spanish. There are masses of free resources available online to supplement our book work, although we have to be careful to select those that teach European Spanish. We especially like the lessons and games at Spanish Games. If Jasper’s interest in Spanish continues, I’ll probably also invest in Mira!, the textbook English schoolchildren Jasper’s age use. Everyone in our family is doing a Udemy course at the moment. Jasper’s main task in the course so far has been to copy lengthy chunks of code which (I know from the WordPress coding course I’m doing) is hard. A single misplaced curly bracket or missed comma causes the whole programme to fail, and trying to discover where you went wrong is like looking for a needle in a haystack. But the intense focus and attention to detail the course requires is great for Jasper’s development. I’m also really impressed by the fact that he works hard to find his own errors before he asks his techy dad for help. Finding outlets for Jasper’s intense energy has been an ongoing challenge during the years we’ve been home-educating. His sensory issues have prevented him taking part in activities like scouts that his sister enjoys. Team sports don’t work for the same reason. Because it takes a huge amount of focus and emotional energy for Jasper to join in any group activity, I’m incredibly proud of him for what he does achieve. For instance, he’s been doing group homeschool figure skating lessons for over two years now and recently completed the final level (eight) of the Basic Skills Programme. He’s now working towards his Bronze award. Jasper’s also been going to a gymnastics class for 18 months, and recently started a martial arts tricking class (a fun cross between parkour, gymnastics and martial arts), which both he and Cordie love. I’m also very proud of Jasper for sticking with piano lessons for over a year. He even started practising a bit between lessons recently! I think this is the most comprehensive post I’ve ever written about Jasper’s learning. There’s always so much to say about my busy, extroverted daughter who loves to chat about her passions and dreams. Jasper, meanwhile, is my child who quietly taught himself to read, write and spell by playing video games, who astounds us all with what he learns from YouTube videos, and who recently set about reducing his screen time with a sense of commitment and self-discipline that left me with no concerns about his ability to achieve whatever he sets his mind to. I don’t know what Jasper’s future has in store, but I’m looking forward to watching it unfold. In the meantime I’ll keep doing what I’ve done for the last six years: chatting with him about what he enjoys and where he wants to go, and offering resources and activities I think he’ll enjoy. What are you and your learning this year? If you’d like to follow along with the second half of our unschooling journey, don’t forget to leave your email address in the box below. You can also like Navigating By Joy on Facebook. I’m appreciatively linking up with Kris at Weird Unsocialized Homeschoolers. Sounds wonderful! I am going to check out several of your links. 🙂 Thank you for sharing. What an interesting post! He sounds a little like my son, James. I really love the way you homeschool! He has covered a lot of subjects. I am interested in hearing more about the dendrites. Thank you, Phyllis! Sometimes it feels like Jasper doesn’t learn very much, probably because everything happens so quietly and naturally with him (well, mostly ;)). So it’s good sometimes to write it all down and appreciate that there actually is quite a lot going on. I’ll share more about our tin experiments soon. We made a tin ‘hedgehog’ today! I am a new follower. I am so glad I found your blog. I have been working through all of your posts and am finding so much helpful information. I am in my second year of homeschooling and I really love the way your kids learn. I am trying to figure out how to implement a similar approach for my kids – especially math and science. I only wish I had found your site sooner! Thank you for all the helpful information! Thank you so much for your kind words about my blog. Yay! Our copy of Molecules has arrived. We loved The Elements and this book looks beautiful too. Do you use the apps for these as well? We used to do much more hands-on science work, but lately we’ve been more focused on theory. I really need to work on that and find us some experiments that aren’t just busywork and really support our theory. Enjoy Molecules! We haven’t used the apps much yet, but I think we will more next year when Cordie studies chemistry with her tutor. (She’s doing physics this year.) I’d love to hear how/if you use them. The app we have for The Elements is just a series of short videos about some elements. I wish it had a bit more to it, but having said that, A has watched those videos over and over and over, so it was worth getting. 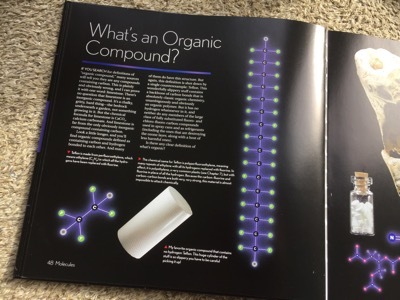 The app for The Molecules has much more than our Elements one, and is a good complement to the book. We particularly like the way you can move molecules around, change the temperature to see what happens and view different models of the same molecule. What has Cordie used for physics? A is all interested in quantum theory at the moment and I’m sourcing a range of resources to satisfy her beginner-level interest. Any ideas?? Yes we like The Molecules app too. So much to fiddle with! Carbon Chemistry looks interesting … I’m tempted. And having looked at Painless Chemistry I’m very impressed with A’s idea of fun! I’m loving that you’re writing about this, because right about now, I’m struggling with the question fo whether I want to go back to work after having been a SAHM for damned near a decade. I used to think that I was dissatisfied with being “just a mom”, but now that I’ve spent some time out in the workforce (and even then only as an intern), I’m yearning for my carefree days of laundry and ergnnd-runniar. It’s a tough thing to reconcile within myself – perhaps good fodder for a post of my own…. what is the benefit of the home schooling?